Mundelein Courthouse | Mundelein Traffic Lawyer The Davis Law Group, P.C. The defense attorneys at The Davis Law Group, P.C. 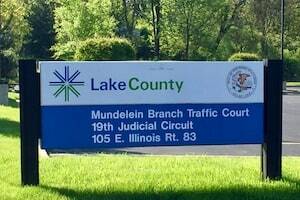 regularly represent clients charged with a variety of traffic tickets and criminal offenses heard at the Mundelein, Illinois branch courthouse located at 105 East State Route 83 (SR83). The facility can be found on the southwest corner of State Routes 83/60 and Diamond Lake Road. While the main Lake County courthouse is located in Waukegan, the Mundelein Branch Court is one of three branches that hear cases in Lake County, Illinois. A variety of traffic violations are heard at the Mundelein courthouse including speeding, accident citations (i.e. failure to reduce speed to avoid an accident), and lane usage violations. While commonly known as a “traffic court”, more serious violations such as driving on a suspended license, possession of cannabis, possession of drug paraphernalia, misdemeanor/aggravated speeding (26 mph or more over the limit), and retail theft are also heard at the Mundelein courthouse. The Clerk of the Circuit Court of Lake County has a facility located inside the Mundelein Courthouse. This office houses all of the files for traffic tickets, ordinance violations, and misdemeanors heard in this courthouse. Requests for continuances and trial dates may be made at this location. Also, any fines, fees and costs may be satisfied at this location. Both the Lake County State’s Attorney’s Office and local village attorneys prosecute the various violations that are heard at the Mundelein courthouse. Villages and cities that have cases assigned to Mundelein include: Barrington, Buffalo Grove, Deer Park, Fox River Grove, Hawthorn Woods, Indian Creek, Kildeer, Lake Zurich, Libertyville, Lincolnshire, Long Grove, Mundelein, Port Barrington, Tower Lakes, Vernon Hills, and Wauconda. If you have received a traffic ticket, ordinance violation, or if you have been charged with a criminal offense, feel free to contact the lawyers at The Davis Law Group, P.C. for a free consultation. Hiring an attorney that is familiar with all local rules and procedures can make a significant difference in your representation. Our professional and experienced attorneys regularly appear at the Mundelein courthouse and throughout Lake County (including Waukegan, Park City, and Round Lake Beach). Contact us today to discuss your case.